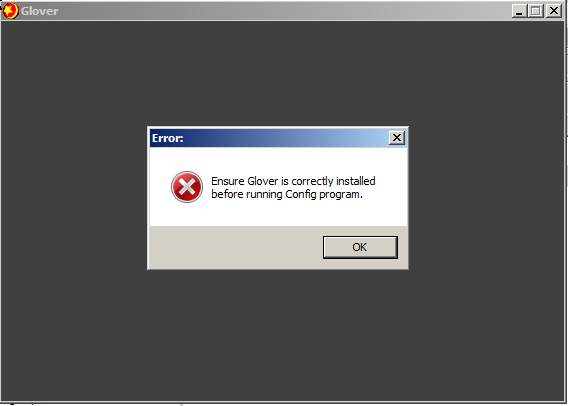 As the title says, I'm trying to get Glover installed on my Windows 7 PC, but when I click on the setup exe, nothing happens. Task manager shows the installer as running, but nothing shows on Windows itself. I've tried that, and I'm getting an error message telling me to "properly" install the game before using it. Find out what registry entries the game created on the system where you first installed it and port them over. Okay, I found the registers it installed on the VM, and copied them over to windows. The config still doesn't run, but now the game starts, but it keeps flashing and runs really slow. I found that there's a 3Dfx option on the config, which I can't access, and copying over the .cfg file doesn't change anything. EDIT: I tried to copy the registries, hoping that the config was saved there, and the game runs as it should but it still flashes and flickers. Did you try using nGlide or dgVoodoo ? Well I need to set the game to 3Dfx mode to try them, but I can't do that because the config gives the error above. Try closing all background processes before running the installer. You mean close any other applications that are running? I'm still trying to get this game installed and running on my PC... any ideas? Cobra! wrote: You mean close any other applications that are running? No all background processes (applications implies foreground applications only imo). Or if you have a newer Windows version just find the installer executable in task manager and click "Analyze wait chain" and just kill whatever process is holding it up. ZellSF wrote: No all background processes (applications implies foreground applications only imo). You want me to kill off every single background process? That's not from Microsoft, yes. There's a way to do the analyze wait chain thing in process explorer if your version of Windows' task manager does not support that option.